If you arrive in Toruń by car, it is advisable to park and use the public transport. The best way to explore any city that is rich in history, art and architecture is on foot, and Toruń Old Quarter is no exception. Much can be discovered by simply looking around you and following the indications in a guidebook, but you can also follow your instincts and explore a street, a square or a courtyard at random. Parking is severely restricted in the Old Quarter of Toruń, and there are three different enforcement agencies (Parking, Municipal and National Police) to watch out for. As regards Toruń areas out of the Old Quarter we suggest to use the public transport (buses and trams) or your car. Riding a bicycle is an alternative. The very centre of Toruń (the Old Quarter; see map here) actually is closed to traffic among other for ecological reasons, especially because exhaust fumes have had a destructive effect on old buildings and monuments. Given its historic nature, the Old Quarter is clearly not designed for modern traffic needs and vehicles. Of course you may enter the Old Quarter with your car but only to park there in few marked streets. Parking is severely restricted in the centre of Toruń which is Paid Parking Zone (Strefa Platnego Parkowania). It's divided into two sub-zones: Podstrefa A (sub-zone A) - colour red and Podstrefa B (sub-zone B) - colour yellow. The whole area of the Old Quarter is Sub-zone A and the area surrounding it is Sub-zone B (see the following map) and parking there is a bit cheaper (see the price list rigth). Charges apply from Monday till Friday within the hours: 8am - 6pm and on Saturday within the hours: 9am - 3pm. Sunday is free. Parking fees are based on the length of your stay. Fare is collected for each vehicle parked within the zone. Drivers pay the parking fee in parking meters (Polish: Parkometr - see the picture on the right) located along streets in the city centre. So watch the road signs carefully when approaching the city centre. Anyone who leaves a car anywhere, on a place not prepared for parking within the Paid Parking Zone must reckon with the high penalty. Municipal guard is also empowered to establish locks on the wheels of a car. The phone number of guards, to which you call to regulate and release the vehicle from the blockade, will be given to the mandate attached to the lock. The best solution is to leave your car at a guarded car park out of the Old Quarter. • Related links: How to get to Torun - click here. Paid Parking Zone in Toruń Map. Click the picture to enlarge. It's hard to find a parking place in the city centre, particularly in the Old Quarter, although both in Toruń and other tourist cities of the region one has to pay when parking. 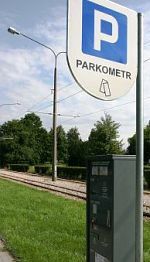 Drivers pay the parking fee in parking meters (Polish: Parkometr) located within eyeshot along on the fragments of streets prepared for parking. Network of MZK company trams and buses provides a safe, efficient and cheap transport throughout all the city. Buy your ticket from any of a little kiosks that are dotted around the city. All journeys (tram and buses) cost the same (2,70 PLN), the distance and the time of journey doesn't matter. You can also buy a ticket from the driver but only at a first stop of the route. Just after boarding the bus or tram you have to punch (validate) your ticket in one of the little black or yellow boxes that are located all around. Keep it for a case of checks. Both buses and trams operate from 5am till 11pm. 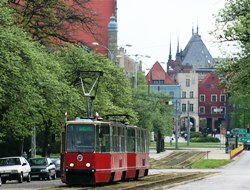 The most important bus and tram stops around the Old Quarter are: Plac Rapackiego (Rapackiego Square), Plac Teatralny (Theatre Square), Plac Św. Katarzyny (St. Catherine Square) and Odrodzenia. Toruń's trams are red and buses are white. Taxis are available at all train stations, bus station and in the city centre. You can take a taxi both at a taxi rank or by phone calling one of the taxi corporations. Calling a taxi by telephone is cheaper than hailing one on the street. If calling one of the abbreviated numbers such as 19333 please be aware that you may need to prefix it with 56 if calling from your mobile. In trustworthy taxis, there's a 5,50 PLN starting fee, after that you pay 2 PLN/km (nighttime: 2,60 PLN/km). To get around Toruń by bike is not that easy as the marked bicycle lanes, unfortunately, do not create the interconnected network, and only single sections. In total, these sections provide nearly 21 km bicycle path. However we recommend bicycle trips in the vicinity of Toruń. A good starting point is Barbarka - a forest district located in north-western outskirts of Toruń. Barbarka itself is a great recreational centre, with many devices and forest paths.